This spectacular waterfall drops 50 feet over moss-lined rock cliffs. The .8 mile trails is moderately accessible to people with disabilities. After reaching the falls, hikers can continue on a difficult trail (not diabled accessible, .4 mile to the Susan Creek Indian Mounds. Directions: At milepost 28.2 on Hwy 138. Information from BLM Thundering Waterfalls guide. KID-FRIENDLY with caution and a few moderately steep climbs. A one-mile trail passes though a narrow bedrock crevice and lush vegetation to a double falls with tiers of 35 and 50-feet. Don't stop at the bottom. Continue up to the right to get to the top for another complete view. Also, off the trail is Job's Garden Trail at .5 mile point, leading to the base of a basalt columnar rock outcropping. Directions: At milepost 32.2 on Hwy 138 turn north onto road 24. Trailhead parking is on the northside of the highway right off of the highway. Information from BLM Thundering Waterfalls guide. Toketee Falls in February while snowing. The Trail goes through an old-growth forest along the North Umpqua River with views of cascading water through a narrow rock gorge. The trail has 200 steps leading to a sturdy deck overlooking the two-tiered falls. Directions: At milepost 58.6 on Hwy 138 turn north onto road 24. Stay left at the Y and cross the bridge. Trailhead is on the left. Information from BLM Thundering Waterfalls guide. This majestic waterfall is the highest in southwest Oregon, plunging 272 feet over the edge of a basalt lava flow. A wooden bridge crosses Watson Creek and goes up to the left to get the closest look of the falls. Directions: At milepost 60.5 on Hwy 138, turn south on Road 37, parking is on the right. Information from BLM Thundering Waterfalls guide. Found in the same area as Mill Creek Falls, you get a two for one on this trip! 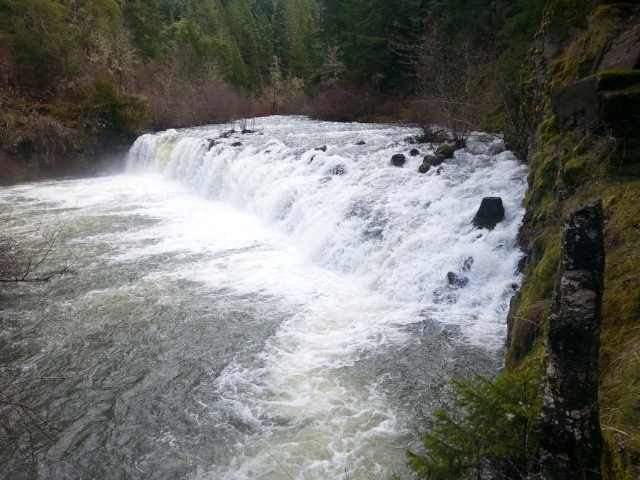 Just keep walking up the main trail past Mill Creek Falls viewpoint and you will run right into Barr Creek Falls. Tiered horestail falls that plunges 150 feet to the canyon floor to the Rogue River. Take Crater Lake Hwy north then take a left on Butte Falls Hwy as you enter Butte Falls the road to the waterfall will be on your left side right before you enter town. Drive down the road and there will be a little parking area where you can park and view the waterfall. No hiking to see this one. The falls hurdle 173 feet into the Rogue River Gorge. Though they exhibit somewhat of a seasonal fluctuation of flow, the falls don't change their appearance much, making it a good destination any time of year. Actually in Douglas County, but not too far from Union Creek. The falls occur where the spring-fed creek diverges around a basalt outcropping and plunges about 40 feet over a jagged ledge in two scenic channels. The grotto below the falls is exceptionally scenic and thriving in greenery, with a small meadow of mosses growing on a flat area just downstream of the falls where Falls Creek merges with National Creek. The falls flow very consistently and are good to visit any time of the year. Pearsony Falls is not a tall fall but it is very beautiful trail to get there. It has a very wide path and it is about only a 1/4 of a mile to get there for the view. Be careful when you are trying to get pictures, the rocks are very slippery. If you continue on the path you will reach the top of Mill Creek Falls and a top view of Avenue of the Boulders. To get there you will take the same road as Mill Creek Falls going into Prospect. As you head into Prospect you will see a rest area on the right side (no sign). That is where you will park to walk to Pearsony Falls.